Zen Kannon is a centre dedicated exclusively to the practice of Zen, based on regular sitting meditation, zazen, which can be practiced at Zen Kannon throughout the week. 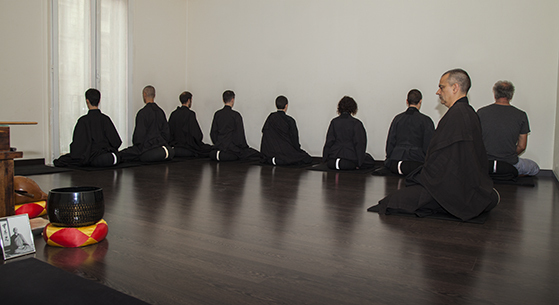 To encourage zazen practice, we offer many activities to refine the practice of meditation, as well as the study of the Zen Way. The center is and open to everyone regardless of age, race, religious beliefs, ideology or sexual orientation. Whether you want to take your first steps in meditation to reduce stress and relax, you are a meditator looking for a more advanced group practice, or even if you want to commit to a rigorous practice of Zen buddhism, Zen Kannon welcomes you. Everyone at Zen Kannon, whether practising secular meditation or developing a complete zen buddhist approach, practises together in harmony under the guidance of the same master. The activities at the center are suitable to everyone, regardless of your level of knowledge about meditation and Zen. You too can find the schedules and activities most suitable for you, under the guidance of master Lluís Nansen. We are a non-profit organization called Dojo Zen Barcelona Kannon, Buddhist Centre. Address Ronda de la Universitat 14, 2nd 1a, 08007 Barcelona. Wide availability of schedules: mornings, lunchtime, evenings and weekends. The master is present and available in all the meditation sessions. We offer several activities to develop the practice of Zen. Our centre is spacious, quiet and air-conditioned. Very well connected to Barcelona city centre. Metro: Catalunya (L-1, L-3), Universitat (L-2, L-1), Passeig de Gràcia (L-2, L-3, L-4). Train: Catalunya, Passeig de Gràcia. Railways: Catalunya. Bicing: Catalunya square, Universitat square.